There are a variety of great choices for mid-range Fort Myers Beach hotels that are ideal for families and travelers of all types as well as budget beach goers looking for easy beach access. Families that want a resort style atmosphere with a kid’s club should try the DiamondHead Beach Resort or the Pink Shell Beach Resort and Marina where you can find complimentary watersport equipment. Condominium style units at the GullWing Beach Resort, the Neptune Resort and Lovers Key Resort are perfect for families looking to save on food costs. Couples will enjoy the serenity of Pointe Estero Beach Resort and the Sandpiper Gulf Resort offers a quiet atmosphere. Value minded families and beach goers should stay at the Wyndham Garden Fort Myers Beach, the Pierview Hotel and Suites and the Best Western Plus Beach Resort offers a complimentary breakfast. The Pink Shell Beach Resort and Marina is an upscale Fort Myers Beach hotel that boasts plenty of complimentary amenities, nice accommodations and there is a marina for boat travelers. 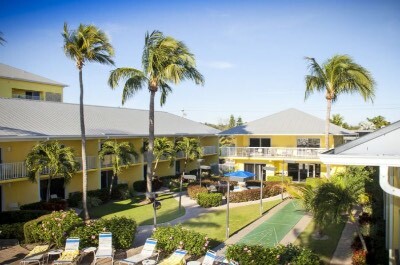 Located on the northern most point of Estero Island along Estero Boulevard, the Pink Shell Beach Resort and Marina is situated within 12-acres of a lush tropical environment that is directly on the beach and is within 1-mile to Times Square and Bowditch Point Park. The Pink Shell Beach Resort and Marina has a modern ten floor architectural style with 211 rooms and suites that feature a contemporary upscale decor. Sanibel view studios are the smallest with an open floorplan that includes a choice of bedding, a full kitchen and private balcony that has gulf views. Captiva villas are 656 square feet with a separate living room, a full kitchen/dining area and a private balcony that has gulf views. The one-bedroom White Sands villas have varying floorplans with a separate living room, full kitchen/dining area and a private balcony that features views of the pool as well as the gulf. Two-bedroom Beach villas have 1,000 square feet with a separate living room, a full kitchen/dining area and an oversized balcony that boasts beach front views. The Pink Shell Fort Myers Beach hotel has a perfect place on a white sand beach where you can enjoy complimentary use of beach and watersport equipment. For boat travelers there is a 41-boat slip available for mooring and you can restock on necessities while you are relaxing at the resort. The Pink Shell Beach Resort and Marina is nearby to many attractions that include Bunche Beach, the Sanibel Island Lighthouse and the Mound House. Children can enjoy themselves at the kid’s club where they will find organized activities and adults can indulge in events around the resort. The property has three freshwater swimming pools that include waterfalls, a children’s splash pool and a nice sundeck. There is a fitness center and a full service spa. Dining onsite includes a complimentary breakfast with lunch and dinner available at Jack’s Farm to Fork Restaurant as well as Bongo’s Beach Bar and Grill. Nightlife includes live music at Bongo’s Beach Bar and Grill or you can venture to the Smoking Oyster Brewery for a craft beer as well as the Beach Pub for a lively atmosphere. When you are interested in booking a value oriented mid-range Fort Myers Beach hotel that is great for families, has private beach access and offers kitchens in every room then the Best Western Plus Beach Resort is superb. Located on Estero Boulevard within the northern portion of the island, the Best Western Plus Beach Resort is directly on a private white sand beach that overlooks the Gulf of Mexico and is within 3-blocks to Times Square. The Best Western Plus Beach Resort has a modern five story architectural design with 75 rooms and suites that boast a contemporary interior. Standard rooms have a choice of bedding, a small full kitchen and a private balcony that has views of the island or gulf front. Mini-suites are larger with an integrated living area that has a sofa sleeper, a full kitchen, a choice of bedding and a private balcony that boasts Gulf of Mexico views. One and two-bedroom suites have a variety of bedding choices, separate living room that has a sofa sleeper, a full kitchen and a private balcony that features gulf views. The two-bedroom Master suite is 1,100 square feet with a separate living room, a full kitchen, 2-bathrooms and a private balcony that has gulf front views. There is also a Cottage suite that features bi-level living with two-bedrooms, a full kitchen, a separate living room, 2-bathrooms and a wraparound balcony with gulf front views. The Best Western Plus Fort Myers Beach hotel has a great place on a private section of white sand beach where you will find water and beach equipment for rent onsite. The property is within a short distance to many attractions including the Ostego Bay Marine Science Center, Bowditch Point Park and Lynn Hall Memorial Park. The Best Western Plus Beach Resort has a freshwater swimming pool with a nice sundeck that overlooks the gulf, a playground area, picnic tables and shuffleboard courts. Dining includes a complimentary breakfast and you can find plenty of dining options within walking distance that include Pete’s Timeout, Yucatan Beach Stand Bar serves Southwestern dishes and the Fish House prepares seafood. Nightlife is a short distance with the Pierside Grill and Famous Blowfish Bar, Top O’Mast and the Beached Whale has live music. The DiamondHead Beach Resort is a superb mid-range Fort Myers Beach hotel that boasts a lively resort atmosphere with plenty of activities, has great beach access and is perfect for all types of travelers including families. Located along Estero Boulevard in the northern section of the island, the DiamondHead Beach Resort is situated directly on the beachfront and is only 6-blcks to Times Square as well as the Matanzas Pass Preserve. The DiamondHead Beach Resort has a modern fourteen floor architectural style with 124 one-bedroom condominiums that have a trendy beach decor. One-bedroom units have 700 square feet with a separate living room that contains a sofa sleeper, a small kitchenette (microwave and refrigerator) or full kitchen (deluxe suites only) and a private balcony that sports views of the island, pool or Gulf of Mexico. The DiamondHead Beach Resort has a nice spot on a white sand beach where you can lounge or play games and there are watersport activities for rent onsite. The DiamondHead Fort Myers Beach hotel is close to several interesting attractions such as the Crescent Beach Family Park, the Ostego Bay Marine Science Center and Lynn Hall Memorial Park. The property has a lively atmosphere with a full time entertainment staff that provides organized events for adults as well as children within a kid’s club and there are complimentary bicycles for land exploration. The DiamondHead Beach Resort has a freshwater swimming pool that has a nice sundeck, a fitness center and a spa. Dining onsite includes the Cabanas Beach Bar and Grill for snacks and light fare as well as Chloes Seafood and Steaks prepares breakfast and dinner. Offsite dining within a short walk is plentiful with Edelweiss Burger, Mom’s Restaurant for comfort food and the Salty Crab Bar and Grill prepares seafood. Nightlife is fun at the resort with drink specials at Chloes Lounge with karaoke on selected nights and Cabanas Beach Bar and Grill has live music or you can walk to the Smokin Oyster Brewery for a craft beer. When you are looking for a value oriented mid-range Fort Myers Beach hotel that is close to several attractions, is on a quiet portion of the beach and offers kitchenettes then the Neptune Resort is great. Located on the northern portion of Estero Island along Estero Boulevard, the Neptune Resort is situated directly on a white sand beach overlooking the Gulf of Mexico and is less than 1-mile to Times Square. The Neptune Resort has a modern two and three story architectural design with 71 suites that boast a simplistic contemporary interior. Studios are sized at 450 square feet with a choice of bedding, a small kitchenette (microwave and refrigerator), corner units are available and views range from the city to courtyard to pool to the gulf from a shared balcony. One-bedroom suites have 500 square feet with a separate living room that has a sofa sleeper, a full kitchen, a choice of bedding and a view of the pool or gulf from a shared balcony. Three-bedroom suites have a separate living room that includes a sofa sleeper, a full kitchen, 3-bathrooms, a private office area and a private balcony that features views of the pool as well as the gulf front. The Neptune Resort has a great white sand beach where you will find lots of space to relax and there are numerous vendors with watersport equipment for rent. The resort is within walking distance to many attractions such as the Fort Myers Beach Fishing Pier, Matanzas Pass Preserve and the Mound House. 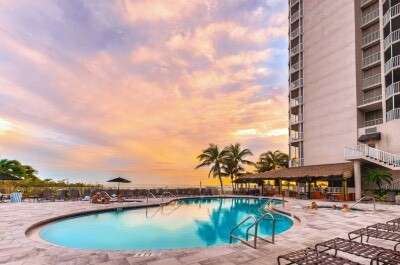 The Neptune Resort Fort Myers Beach hotel has two freshwater swimming pools with sundecks that have barbeque grills, shuffleboard courts and a fitness center. There is no restaurant onsite and offsite dining is plentiful within walking distance includes the Heavenly Biscuit, Mr. Tequila prepares Mexican dishes as well as the Dixie Fish Company serves seafood. Nightlife within a short walk includes live music at the Beach Pub, the Cottage Bar and the Shamrock Irish Pub has a lively neighborhood atmosphere. 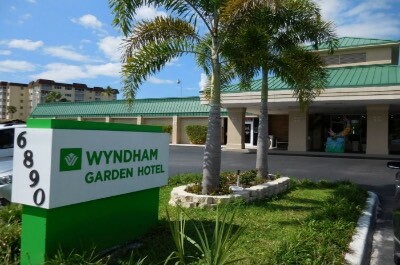 If you are interested in finding a mid-range Fort Myers Beach hotel that boasts great beach access, is good for families and is in a quiet neighborhood then the Wyndham Garden Fort Myers Beach is superb. 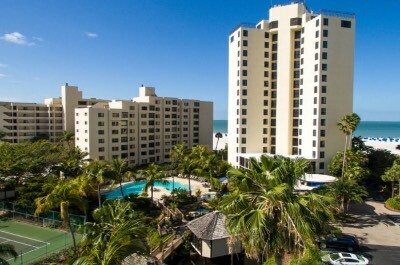 Located in the southern portion of the island along Estero Boulevard overlooking the Gulf of Mexico, the Wyndham Garden Fort Myers Beach is steps away from a perfect beachfront scene of white sand and is only 2.5-miles away from Lovers Key State Park. The Wyndham Garden Fort Myers Beach has a modern two floor architectural style with 103 rooms and suites that feature a contemporary decor. Rooms are 320 square feet with a choice of bedding, a small kitchenette (microwave and refrigerator), most rooms have a sofa sleeper except ADA and a private balcony that features views of the beach, city, pool or beachfront (courtyard rooms do not have a balcony). Two-bedroom suites are spacious with a separate living room a full kitchen, 1.5-bathrooms and a private balcony that has views of the Gulf of Mexico. The Wyndham Garden Fort Myers Beach has a perfect spot on the beach where you will find plenty of watersport activities from outside vendors and room to lounge. The property is less than 4-miles to many attractions such as Times Square, the Mound House and the Matanzas Pass Preserve. The Wyndham Garden Fort Myers Beach hotel has a large freshwater swimming pool with a sundeck and drink service at Pincher’s Tiki Bar as well as a fitness center. Dining onsite includes breakfast as well as dinner at Pincher’s. Offsite dining options within a short distance to the hotel include the South Beach Grille has steaks, Skye’s Restaurant prepares Mexican specialties and Charley’s Boat House Grill serves seafood. Nightlife includes live music at Pincher’s tiki Bar on selected nights or you can try Castaways and the Fort Myers Beach Theater is great for families. Families as well as couples that are searching for a mid-range Fort Myers Beach hotel that is quiet, laid-back with great beach access and boasts all-suite accommodations. Located on the southern portion of Estero Island along Estero Boulevard, the Gullwing Beach Resort provides easy access to a nice beach area overlooking the Gulf of Mexico and is within 4-miles to Times Square. The Gullwing Beach Resort has a modern twelve story architectural design with 66 condominium units that boast a simple beach interior. One-bedroom units have 1,250 square feet with a separate living room, various bedding choices, floor to ceiling windows, a full kitchen and views of the island, bay or beachfront from a private balcony. Two-bedroom condos are 1,600 square feet with a separate living room, full kitchen, floor to ceiling windows, 2-bathrooms and a view of the gulf, island or beachfront from your private balcony. Three-bedroom accommodations are sized at 2,125 square feet with a separate living room, full kitchen, floor to ceiling windows, 2-bathrooms and a private balcony that has a beachfront, gulf or island view. The Gullwing Beach Resort Fort Myers Beach hotel has a great spot on a white sand beach where you will find plenty of vendors with watersport and beach equipment rentals as well as plenty of space to lounge. The resort is close to several attractions that include Lovers Key State Park, the Mound House and Little Hickory Beach Park is 5-miles away. The Gullwing Beach Resort has a nice freshwater swimming pool with a snack bar as well as a sundeck, tennis courts, a fitness center and there are barbeque grills. Dining includes a relaxed home cooked meal or you can venture to one of many eateries within a short distance that include Charley’s Boat House Grill, Skye’s Restaurant serves Mexican dishes and Francesco’s Italian Deli and Pizzeria. Nightlife nearby includes the Outrigger Tiki Bar and Deckside Cafe for drinks and Castaways is ideal for families looking for fun. The Pointe Estero Beach Resort is a great mid-range choice of a Fort Myers Beach hotel that offers numerous amenities onsite and a family-friendly atmosphere with all-condominium units. Located in the southern section of Estero Island along Estero Boulevard overlooking the Gulf of Mexico, the Pointe Estero Beach Resort has a nice wide beach area and you are less than 3-miles away from Lovers Key State Park. 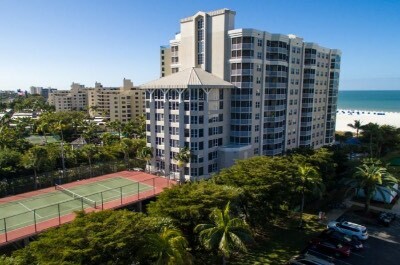 The Pointe Estero Beach Resort has a modern sixteen floor architectural style with 60 one and two-bedroom condominium units that feature a Florida beach decor. One-bedroom units have 1,500 square feet with a separate living room, full kitchen, floor to ceiling windows and a private wraparound balcony that sports views of the Gulf of Mexico or the beachfront. Two-bedroom condominiums are 1,750 square feet with a separate living room, full kitchen, floor to ceiling windows, 2-bathrooms, wet bar and a wraparound balcony that has views of the beachfront or gulf. The Pointe Estero Fort Myers Beach hotel has a nice wide white sandy beach area where you will find beach and watersport equipment for rent as well as picnic tables for eating. The resort has an island trolley in front that will take you to Time Square and you are a short drive from Matanzas Pass Preserve as well as Koreshan State Historic Site. The Pointe Estero Beach Resort has a nice freshwater swimming pool with a sundeck that has barbeque grills, a fitness center; tennis courts and there are occasional organized activities for children. There is not a restaurant onsite but you can indulge in a leisurely home cooked meal in your unit or you can venture to several nearby eateries that include Pinchers, South Beach Grille has steaks as well as Francesco’s Italian Deli and Pizzeria. Nightlife includes a stunning sunset from your private balcony or you can take the family to the Fort Myers Beach Theater for a movie and the Sandbar and Grill has a lively family atmosphere. When you are searching for an all-apartment Fort Myers Beach hotel which is great for families who are seeking the comforts of home, good onsite amenities and is within a quiet area then the Lovers Key Resort is superb. 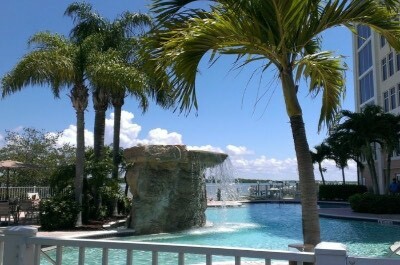 Located along the southern portion of the island adjacent to Lovers Key Resort off of Estero Boulevard, the Lovers Key Resort is situated on a small beach area overlooking the Estero Bay Aquatic Preserve and you are less than 6-miles from downtown Fort Myers Beach. The Lovers Key Fort Myers Beach hotel has a modern fourteen story architectural design with 100 apartment units that feature a contemporary interior that varies from unit to unit. One-bedroom apartments have 600 square feet with a separate living room that has a sofa sleeper, floor to ceiling windows, a full kitchen and a private balcony that sports views of Estero Bay, Lovers Key State Park or the Gulf of Mexico. One-bedroom luxury and penthouse suites are 800 square feet with a separate living room that has a sofa sleeper, floor to ceiling windows, full kitchen and a private balcony that offers views of Lovers Key State Park, the Gulf of Mexico or the Estero Bay. The Lovers Key Resort has a small beachfront and you are within an easy drive to a 2.5-mile beach within Lovers Key State Park where you will find plenty of watersport activities as well as equipment rental. The resort is within a short drive to many attractions such as Koreshan State Historic Site, the Coconut Point Mall and you can take the island trolley to Times Square where you will find plenty of entertainment venues. 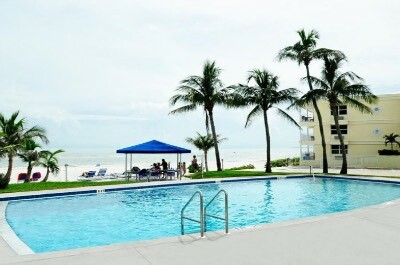 The Lovers Key Fort Myers Beach hotel has a freshwater swimming pool with a nice sundeck and a fitness center. Dining options include a freshly cooked meal in your suite and there is Flippers on the Bay which serves all three meals. Other dining options offsite require a short drive which include Heidi’s Island Bistro for European specialties, the Fresh Catch Bistro prepares seafood and the Heavenly Biscuit. Nightlife also requires a drive with your best options at Time Square where you will find numerous restaurants with live music as well as street performers. If you are interested in a mid-range Fort Myers Beach hotel that is ideal for families as well as couples, offers kitchens and provides for easy beach access then the Sandpiper Gulf Resort is perfect. Located on Estero Boulevard along the middle of the coastline of Estero Island, the Sandpiper Gulf Resort has a 315-foot white sand private beach area and is around 3-miles to downtown Fort Myers Beach where you will find Time Square. The Sandpiper Gulf Resort has a modern three floor architectural style with 63 rooms and suites that boast a West Indies beach decor. Courtyard, poolside and beach front studios are sized at 430 square feet with an open floorplan that contains a sofa sleeper, a choice of bedding, floor to ceiling windows, a full kitchen and a private balcony which has associated views. Beach front and island view studios range in size from 460 to 500 square feet with a choice of bedding, a full kitchen, sofa sleeper, floor to ceiling windows and a private balcony with island or beach front views. The one-bedroom penthouse suite has 700 square feet with a separate living room, kitchen area, floor to ceiling windows and a private balcony with Gulf of Mexico views. 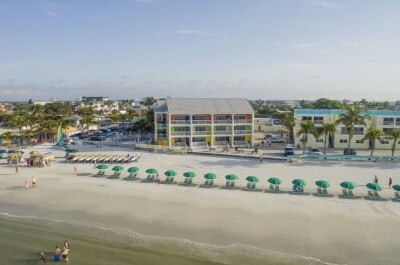 The Sandpiper Gulf Fort Myers Beach hotel boasts a 315-foot private white sand beach area where you will find beach volleyball as well as beach and watersport equipment rental onsite. The property is situated close to several attractions within 5-miles which include Lovers Key State Park, the Mound House and Matanzas Pass Preserve. The Sandpiper Gulf Resort has two freshwater swimming pools including an adult’s only and family pool with a nice deck that has shuffleboard as well as barbeque grills. You have access to a fitness center at the resort’s sister property named the Pink Shell Beach Resort and Marina. The resort does not offer an onsite restaurant and dining includes a leisurely home cooked meal in your suite. Offsite dining options within a close distance include the Bayfront Bistro for American specialties; Charley’s Boat House Grill has seafood as well as the Outrigger Tiki Bar ad Deckside Cafe. Nightlife includes taking the kids to the Fort Myers Beach Theater or you can enjoy a family-friendly evening at the Sandbar and Grille. The Pierview Hotel and Suites is an ideal mid-range Fort Myers Beach hotel for families that want quick beach access, the convenience of cooking in-room and close to many entertainment venues. Located along the western section of the island on Estero Boulevard, the Pierview Hotel and Suites is directly on a white sand beach overlooking the Gulf of Mexico and is within 2-blocks to Times Square. The Pierview Hotel and Suites has a modern three story architectural design with colonial accents that contains 58 rooms and suites that feature a colorful nautical themed interior. Basic rooms are 144 square feet with a small kitchenette (microwave and refrigerator) and views of the surrounding area from a shared balcony. Studios are larger with an open floorplan that includes a sofa sleeper, breakfast bar which has a full kitchen, floor to ceiling windows and a shared balcony with views of the coastline or Gulf of Mexico. Suites have an open floorplan that includes a living area with a sofa sleeper, full kitchen, floor to ceiling windows and a private balcony that has views of the gulf. One-bedroom villas have a separate living room with a sofa sleeper, full kitchen, floor to ceiling windows and views of the gulf. The Pierview Hotel and Suites has a perfect spot on the beach where you will find plenty of space to relax and watersport opportunities are available from outside vendors. The Pierview Hotel and Suites Fort Myers Beach hotel boasts easy access to several nearby attractions within 1-mile that include Crescent Beach Family Park, Matanzaz Pass Preserve and the Ostego Bay Marine Science Center. The property contains a freshwater swimming pool with barbeque grills that overlooks the beach area. There is not a restaurant onsite and you have the convenience of in-suite cooking. The hotel is close to several eateries within an easy walk which include the Salty Crab Bar and Grill, Edelweiss Burger and Yo Taco. Nightlife nearby includes a craft beer at the Smokin Oyster Brewery or you can listen to live music at the Beach Pub.